Figure A76. Sangihe anomaly, interpreted as the Sangihe slab, with (horizontal) [vertical] cross sections through (A)[D] the UUP07 p-wave) and (B)[D] the combined SL2013 and S40RTS s-wave models at 2170 km; C) the location of the modern geological record that we interpret to have formed during the subduction of the slab. The Sangihe anomaly (Figure A76) was imaged by Widiyantoro and van der Hilst (1997), Rangin et al. (1999), and Hall and Spakman (2002; 2004) and is interpreted as one of the two actively subducting slabs attached to the Molucca Sea plate, the other one being the Halmahera slab.The Sangihe slab dips to the NW below the island of Sulawesi and the Sangihe arc and reaches the base of the upper mantle. At shallow upper mantle levels the slab is separated into several slabs (Hall & Spakman 2015, Wu et al. 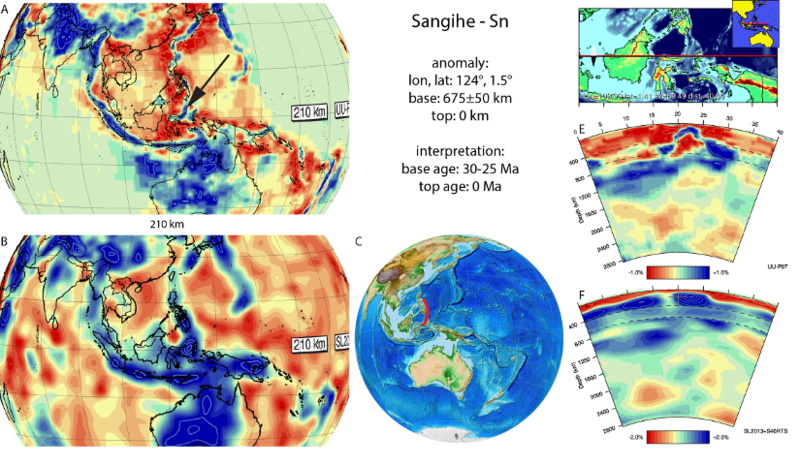 2016), from north to south including the Philippine Trench slab, Molucca Sea West slab, Sulu and Celebes Sea South slab (Wu et al., 2016). The deepest part of the Sangihe slab, named Molucca Sea West slab in Wu et al. (2016) possibly penetrates into the lower mantle, where it merges with the large Kalimantan anomaly. In the reconstruction of Hall (2002), subduction below the Sangihe arc started ~25 Ma, whereas the reconstruction of Wu et al. 2016 assume a start at ~30 Ma. We therefore use 30-25 Ma as age for the base of the slab.